Situated on the suburban edges of the Lone Star State’s Dallas-Fort Worth Metroplex, McKinney attracts those looking for quiet and safe neighborhoods within easy commuting distance of downtown Dallas. Housing options for the more than 130,000 inhabitants in McKinney range from carefully preserved Victorians to sprawling ranch-style estates. Quality of life is important in this 150-year-old city, and many homeowners upgrade their properties with amenities like swimming pools that offer fun and relaxation for their families and friends. At Texas Fiberglass Pools Inc., we ensure that pools, spas, and other water features in McKinney stay stylish and sparkling by providing McKinney fiberglass pool repair, pool resurfacing and pool maintenance. Serving McKinney and the surrounding communities since 1995, the team of contractors at Texas Fiberglass Pools Inc. has experience in a wide range of pool, spa, and baptistery services, from McKinney fiberglass pool repair, leak detection to baptistery resurfacing. When it comes to fiberglass pool resurfacing, we’re the region’s leading experts. 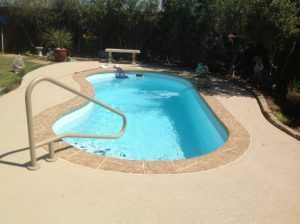 We can erase every crack, scar, and blemish in your swimming pool and make it look and perform like new. Quality resurfacing saves you money on pool maintenance and repairs, and because it significantly lengthens the service life of your pool, you’ll save thousands of dollars down the road on replacement costs as well. When you want to turn your backyard in McKinney into a private oasis, you owe it to yourself to call Texas Fiberglass Pools Inc.. We’ll provide you with a free written estimate before undertaking any project, and we guarantee that you’ll be pleased with the results. Our McKinney fiberglass pool repair and fiberglass pool resurfacing services are recommended for units constructed of ground gunite, concrete, or block and fiberglass walled with concrete bottoms. People commonly use a vinyl, concrete and paint, or concrete and plaster renovation; but these materials are cheap, require more maintenance, and wear out faster than fiberglass. Fiberglass coated pools are able to handle all the angles; steps, curves, and other features within a pool or hot tub are easily coated by fiberglass. Compared to other resurfacing materials, the fiberglass pool resurfacing that we offer through Texas Fiberglass Pools Inc. will hold up for more years of use and require less maintenance. Natural rock waterfalls are becoming more and more popular in backyard and commercial pool designs because they allow users to feel closer to nature, enjoy the view, and relax in the comforting and refreshing sounds provided by the waterfall. We take careful consideration into all our pool rock waterfall projects. We offer both natural rock and artificial rocks, to help create the ideal waterfall based on your budget. Almost anything is possible. Additionally, we examine the height, placement of rocks, and flow of water throughout the formation, to ensure that we achieve a natural look with an enjoyable sound as the water flows through your creation.